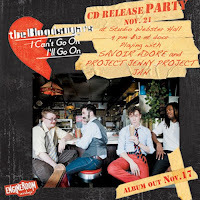 New York band The Bloodsugars released their record I Can't Go On, I'll Go On today , November 17. To celebrate, the band, Jason Rabinowitz (frontman/primary songwriter), Matt Katz (keyboardist), Brendan O’Grady (bassist), and Kenneth Salters (drummer), are having a record release show. That's right folks, head on over to The Studio at Webster Hall this Saturday, November 21 and help them get their party on.